Science and medicine had long been convinced that thoughts and emotions originate in the brain. However, modern research is proving that thoughts and emotions are energy vibrations that occur in our body, specifically in the matrix of connective tissue which interconnects all cells, tissues and organs. These energy vibrations are then perceived by our brain, where they are processed and verbalised according to our acquired expectations and beliefs. The brain’s function is to assign meaning and to create narratives around these emotions. It is therefore becoming evident that an emotional sensation and the meaning ascribed to it by our brain can be separate from each other. Emotions are expressed over a short period of minutes to an hour or two. When a person says they are some particular emotion e.g. “I am an angry person” and they’re not expressing that emotion – there is no energy in motion. When a person is thinking an emotion instead of expressing it, there can be no chance for them to use the energy of their emotion (in this example, anger) to bring about change. Our emotional state is created by the amount of energy we have in motion. When energy is blocked (lack of motion) we tend towards apathy and depression. Note that exercise i.e. movement of the body, can be effective in relief of depression. Too much energy in motion can cause us to feel anxious or over emotional. Normal levels of emotions facilitate an energy flow that can help us break unconscious patterns of thinking and acting. They are the impetus for action and change in our lives for the better. Your body cannot tell the difference between an actual experience that triggers an emotional response, and an emotion fabricated by a thought process or narrative. Worrying about a disaster that might potentially occur can generate a negative emotion. You can have a thought that generates emotion in your body which is then returned to your brain in a never ending cycle. We are protected from becoming overwhelmed by our body’s ability to hold the energy of an emotion in the connective tissue matrix. This “held” energy can become lodged anywhere in your body and is stuck there until something facilitates its release. The stuck energy negatively affects the normal energetic flow, and therefore can impact upon the health of your body at all levels; cells, tissues and organs. Yoga helps us to access areas of stuck energy. It is an efficient process that gradually delves down through the layers, safely freeing up stuck energy which manifests as thoughts and emotions. Gradually, as energy is released, we can feel more in control of our emotions and have more energy to do the things that are important in their lives. The body maps in the diagram at the top of the page show regions whose activation increased (warm colors) or decreased (cool colors) when feeling each emotion. 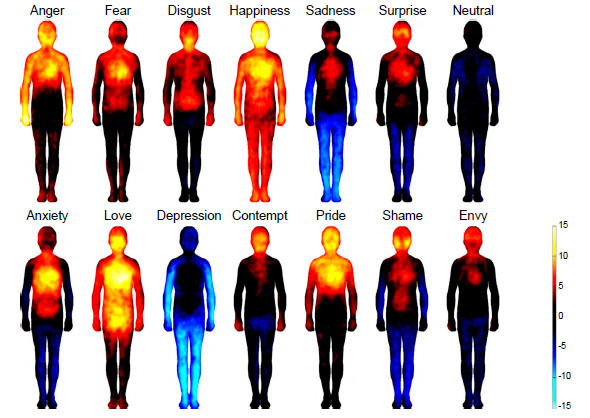 From “Bodily Maps of Emotions” http://www.pnas.org/content/111/2/646.full.pdf.